The Top 50 Cult Movies: Entertainment Weekly Magazine published their list of the Top 50 Cult Movies in their May 23, 2003 issue. Seven of their choices below were pre-1970, and only two pre-1950. The magazine's introduction to the article on the Top 50 Cult Movies stated that "most died at the box office, some of them horribly. Mangled and despised, they were re-animated on video. And now they compose our cultural Esperanto, a subliminal vocabulary of vaguely subversive images, ideas, and phrases that we continue to obsess over and dissect at parties, around watercoolers, in bars, over the blaring banalities of the mainstream media din. They are Cult Movies...So if you take your dead evil and your buckaroos banzai-ed, pour yourself a tall glass of Kool-Aid and peruse this list complete with signature lines and a near Talmudic trove of trivia." 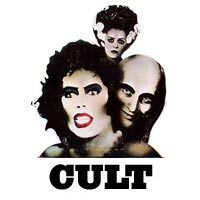 Filmsite has always had its own descriptions and recommendations for well-known and beloved cult films, at Cult Films. "The Greatest Films" site has selected as the "100 Greatest Films". "It's such a fine line between stupid...and clever." "He died in a tragic gardening accident... Authorities said... it's best to leave it... unsolved." "Gobble gobble, gobble gobble... We accept her... One of us, one of us..."
Harold: "You sure have a way with people." Maude: "Well, they're my species!" "Filth are my politics! Filth is my life." "Hey, Grampa, we're gonna let you have this one!" "Let's go get sushi and not pay!" "Shay 'jello to my wittle vrend!" "Wake up. Time to die." "All you of Earth are IDIOTS!" "Greetings, my friends. We are all interested in the future, for that is where you and I are going to spend the rest of our lives. And remember, my friends, future events such as these will affect you in the future." "That is your receipt for your husband...and this is my receipt for your receipt." "Honey, we don't like nothing soft. Everything we touch is hard." "That's what I love about these high school girls, man: I get older, they stay the same age." "There's no room for failure now. The innocent must die!" "Give a guy a gun, he thinks he's Superman. Give him two and he thinks he's God." "Let's head on down into that cellar and carve ourselves a witch." "We can settle this like you got some class, or we can get into some gangster s---." "I know you are, but what am I? Infinity!" "There's a lot of things about me you don't know anything about, Dottie, things you wouldn't understand, things you couldn't understand." "It's a silent movie, but shrieks and gasps can often be heard in the audience." "They're going to nuke the monster!" "What is this, Wonka, some kind of fun house?"